Offshore Only published an article yesterday recapping the 2017 LOTO Shootout Hall of Fame Induction ceremony that took place during the Bob Morgan Memorial Hall of Fame dinner Tuesday evening. Check out the portion about John Tomlinson’s induction, below. Like it’s been the previous four years, the Lake of the Ozarks Shootout Bob Morgan Memorial Hall of Fame dinner ceremony on Tuesday evening at the Stables at Cannon Smoked Saloon in Gravois Mills, Mo., was an unforgettable evening filled with speeches (or lack thereof) and tributes to several people who have made their mark on the event, which celebrates 29 years this week. Last but certainly not least, Burns closed the ceremony by honoring the final member of this year’s class, ace throttleman and multi-time world champion John Tomlinson of TNT Custom Marine in Miami. Unfortunately Tomlinson—a four-time overall Top Gun champion of the event as Dave Scott’s throttleman—had a last-minute cancellation so he couldn’t make it and his current teammate and longtime friend, Myrick Coil, accepted the award for him. Coil explained how deserving Tomlinson is of the honor and read a text that Tomlinson, who holds the event record for the fastest open canopy catamaran top speed at 197 mph, sent to him that thanked everyone involved with the Shootout for the recognition as well as all of his teammates throughout the years. All in all, there was definitely a lot to be thankful for by the end of the fifth annual Hall of Fame ceremony. 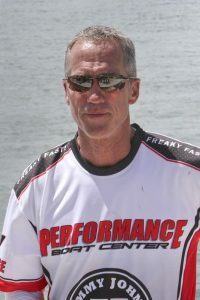 This article originally posted on OffshoreOnly.com.